Grand champion Hakuho survived a scare against komusubi Takakeisho on Thursday as all three yokozuna stayed undefeated at the Autumn Grand Sumo Tournament. Chasing his first victory over the all-time championship record holder, rising talent Takakeisho (1-4) looked to be on the verge of an upset on the fifth day of the 15-day tournament as he pushed Hakuho to the straw. However, the Mongolian grand champion sidestepped Takakeisho's attempt at a force out, pulling him off balance before slapping him to the floor of the ring at Ryogoku Kokugikan. In perhaps his strongest performance of the tournament so far, Kisenosato was once again made to backpedal before winning with an impressive overhand throw against Shodai, No. 3 among the rank-and-file maegashira. 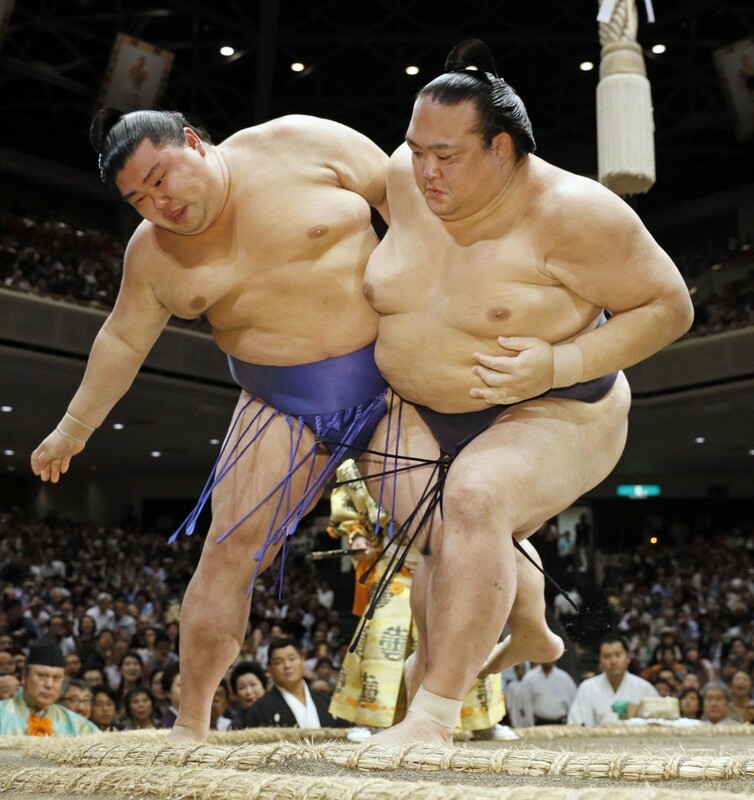 After securing an inside grip, Shodai (2-3) countered an attempted throw by Kisenosato and drove the Japanese yokozuna to the edge of the ring. But as the maegashira looked to gain a grip with both hands, Kisenosato sent him tumbling to the clay. The other Mongolian grand champion, Kakuryu, showed superior speed and technique against No. 2 maegashira Chiyotairyu to secure a routine win by front force out. Kakuryu was much faster than his opponent out of the blocks, getting an outside belt grip with his right hand and quickly driving Chiyotairyu (0-5) out backwards. Sekiwake Mitakeumi stayed perfect with a well-executed win over Georgian ozeki Tochinoshin (3-2). Winner of the previous tournament in Nagoya, Mitakeumi opened with a powerful two-handed thrust, preventing Tochinoshin from gaining a belt grip. With the powerful Georgian at the edge of the straw, the sekiwake forced him out backward. Mitakeumi, who could secure promotion to ozeki with a strong result at this tournament, said he welcomed the pressure that came with high expectations. "I think the pressure is positive. I knew Tochinoshin would try to grab my mawashi belt, so I wanted to go low and stay inside. He did get a left outside grip, but I was able to keep my hip placement low and move forward," Nagano Prefecture native Mitakeumi said. Ozeki Takayasu (5-0) demonstrated patience and strong technique to keep No. 1 Ikioi winless. The maegashira opened aggressively and applied an arm hold to his higher-ranked opponent, but Takayasu was able to slip from his grip before pushing him out from behind. The other ozeki, Goeido, improved to 4-1 with a default victory after his scheduled opponent, No. 2 maegashira Yutakayama (0-5), pulled out with an ankle injury. Sekiwake Ichinojo (2-3) broke his three-match losing streak with a force-out win over komusubi Tamawashi (0-5). The 227-kilogram Mongolian withstood an opening barrage before gaining an inside grip with both hands and hoisting his compatriot over the straw. Among the rank-and-file wrestlers, ninth-ranked Hokutofuji and 15th-ranked Yoshikaze maintained perfect records with push-out victories over No. 8 Kotoshogiku (3-2) and No. 14 Chiyomaru (1-4), respectively.